On the blog Hello Sunshine I wrote about using informational text in your classroom. 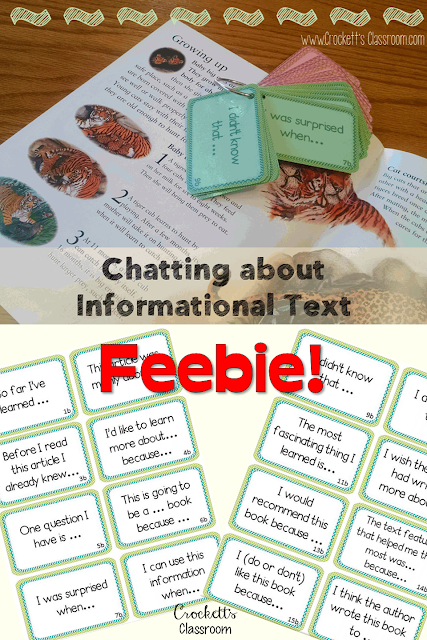 (5 Tips for using Informational Text) I've come up with a few more tips that will help you incorporate informational text into your reading instruction. Most reading lessons that have informational text begin with a whole-class lesson. In that whole-class lesson you'll be teaching specific skills or strategies. Later in the week, though, give your students a chance to read part of the text on their own or with a partner. This gives them time to practice the skills and strategies taught earlier in the week. You can have them reread the section read with the whole class or you can choose a new section. They can use the same graphic organizer you used earlier in the week. (See my blog post on Hello Sunshine for 3 free graphic organizers you can use. 2 Pair informational text with literary text. We're seeing more and more resources that pair informational text with literary text. If you're read a fiction story about pioneers, find some nonfiction books about the westward expansion. Students will be excited to read factual information that goes with the fictional characters and events from the literary text. 3. Encourage students to explore their interests through informational texts. I loved going with my class to the school library. They were naturally drawn to the nonfiction section. When we returned to class I always gave the kids time to share what they'd just checked out from the library. They love showing their friends the treasures they'd just found at the school library! Another way to tap into their natural love of informational texts was with book projects. We had quarterly book projects, like a book report, but much more fun and engaging! I made sure that two of the projects through the year were with informational text. When you set up your literacy centers, make sure you include informational text. Many of the centers you already use can probably be adapted for informational text without much work. One way to use informational text is in a center for partner reading. You can have a selection of informational picture books set out along with sets of discussion cards. Students read the text and stop along the way to chat about the text using the discussion cards. Sometimes I have the stop and chat spots already marked and sometimes I let them choose the spots to stop and talk about the text. Freebie! Click on the image to download a free sample of these Reading Chat Cards. You'll get 16 chat cards for informational text and 16 cards for literary text. 5. Plan activities that require research with the informational text. Kids at all grade levels love projects! They love searching through books, gathering information and then creating a project.